C. L. Koch, 1836 (Vaejovidae) from the Patagonia Mountains, Southern Arizona. 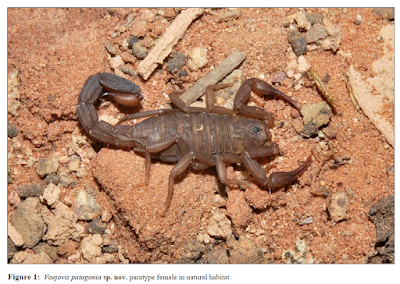 A new scorpion species, Vaejovis patagonia sp. nov. is described and placed in the “vorhiesi” group. This small, dark brown species is found near Patagonia, Arizona. It is geographically closest to V. troupi Ayrey & Soleglad, V. grahami Ayrey & Soleglad and V. vorhiesi Stahnke. Those three species are found in a triangle surrounding the Patagonia Mountains, the locality of Vaejovis patagonia. The pedipalp fixed finger has 5 ID denticles and the movable finger has 6, like most, but not all, of the other southern Arizona Vaejovis. Carapace of female is shorter than metasomal segment V.
Ayrey RF. A New Species of Vaejovis from the Patagonia Mountains, Southern Arizona (Scorpiones: Vaejovidae).